There was a significant jump in yardings this week, but this failed to dampen cattle prices, which continued to rally. In fact, it seems to be rain that is doing the opposite of dampening prices, with prices finding strength, almost across the board. 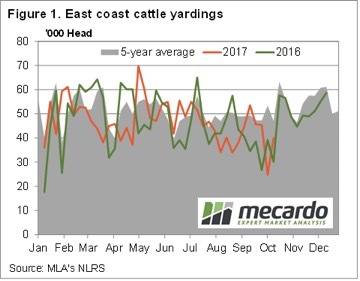 Figure 1 shows a 61% lift in east coast cattle yardings, but this still remains below the very strong levels of September. In fact, the lift in yardings is likely to be more due to the public holiday in the previous week, with a bit of a backlog of cattle hitting the market now. Yardings this week of 40,044 head on the east coast were however well below the five year average. This suggests that producers are holding back cattle in response to recent rain. For October so far, rainfall has ranged from ‘a start’ to very useful across the east coast. It will be interesting to see if yardings remain low, figure 1 shows that on average, and last year, yardings tend to jump in the third week of October. 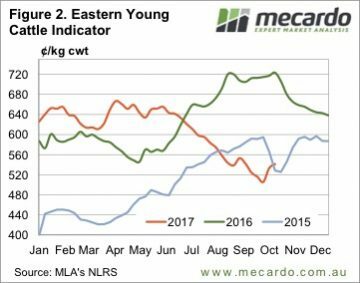 The Eastern Young Cattle Indicator (EYCI) continued to rally, but the pace slowed. The EYCI gained 8¢ this week, to lift it to the levels of five weeks ago, at 541.25¢/kg cwt (Figure 2). Heavy Steer prices managed to break back through 500¢ in NSW (507) and Victoria (518), but somehow managed to slip below those levels in Queensland (492¢). Perhaps there are still a few of the record numbers of grainfed cattle coming to the market. The weakening Australian dollar managed to give beef export prices a small lift. The 90CL Frozen Cow gained 3¢ to 594¢/kg cwt which just moves our target prices a little higher if the rain continues. 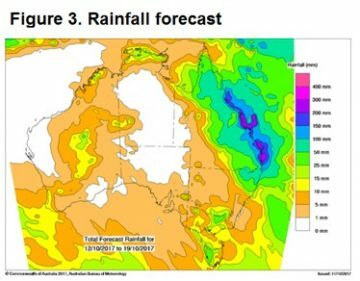 There has been widespread rain over the last 12 days, with parts of Queensland by far outstripping the monthly average. The forecast says there is more to come for at least half of Queensland (figure 3), and this suggests that there is only one way for cattle prices to go next week, especially young cattle prices.